The Breville is a popular brand in many parts of the world, known for its product durability and sturdiness. As the name implies, this model does look professional and is built for heavy duty. This model is commonly used in the industry by juice bars because of its heavy duty capacity and FAST juicing. In fact it’s named America’s fastest juicer, producing an 8-ounce juice in only 5 seconds! 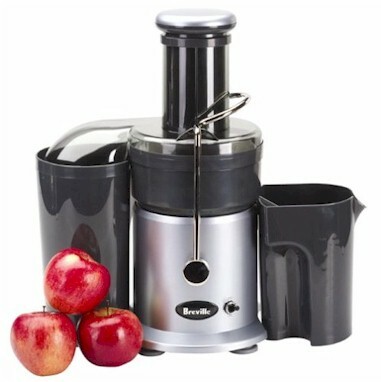 Speed: This machine boasts of a 14,500 RPM (very high speed) which makes it a very fast juicer. Fast is good for industrial use (juice bars) as it saves time and money. Wide chute: It has a 3-inch wide feed chute big enough to feed a whole (small) apple. The wide chute makes for plenty time-saving from having to cut the produce (e.g. carrots, tomatoes, small pears, etc.) to smaller pieces. Easy to clean: Its neat professional design makes it easy to clean. Its dark color parts is an advantage to mask unsightly pigmentation stains. Assembling and dismantling is a breeze. The JE900 comes with an extra large pulp container. Before you start juicing, line the container with a bag to save time washing up later. The juicer parts have smooth rounded edges/surfaces that make them dishwasher safe. Another favorite for people who wants to save time. Speed: Fast is not advisable when it comes to safe and healthy juicing as it also destroys a lot of enzymes and nutrients during the high speed spinning and exchange of +ve and -ve ions that oxidizes the juices. Noisy: A common complaint is that this model when in operation, is TOO loud! I don’t know about you but this is certainly not going to work for me as I like to juice early in the morning before everyone wakes up. Juicing vegetables: If you’re just starting off, you may not consider juicing vegetables. But when you get into serious juicing, you WANT to juice vegetables due to their healing virtues. Then, you will find that this juicer is not very friendly with juicing leafy vegetables or grass (wheatgrass or barleygrass). Froth: Due to its very high-speed spinning, there is bound to be lots of foam produced for every glass of juice. This is why the juicer comes with a froth separator for those who prefer not to include the froth in their juice. I personally won’t drink the froth as it adds unnecessary “gas” into my digestive tract. Wet pulp: As with most centrifugal juicers, the expelled pulp is still rather wet and moist after juicing. This means less juice yield and more wastage. Some users even reported that whole grapes were even flung out of the pulp chute as the motor is “too powerful for its own good”. Messy: Due to its very powerful motor and very high-speed spinning, produce gets flung out from the feeding chute. Make sure you use the food pusher or cover it when feeding produce to avoid it splattering your kitchen ceiling! Warranty: Warranty period is only for one year. There’s a higher chance that the motor might wear off quicker due to the great power required to operate. Whereas a gear juicer could give you between 10-20 years warranty on the motor, which by itself is already a worthwhile investment. Pricey: For its price, I would rather invest in a slower gear/masticating juicer that preserves the enzymes and nutrients; and one that squeezes out very dry pulp. Definitely more economical and a healthier option in the long run. Unless you’re operating a juice bar and time is of the essence!